118 pages - 61 poets. 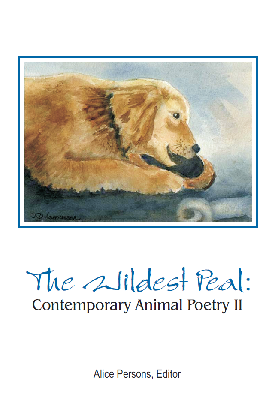 All proceeds go to the nonprofit Maine State Society for the Protection of Animals based in Windham, Maine. Their website is at www.msspa.org. We are proud to tell you that this anthology was a finalist in the Maine Literary Awards of 2016. See the list of finalists and winners in all categories at the Maine Writers and Publishers Alliance website. This is not a review, but more information about the collection. It features the work of 61 poets from Maine, New Hampshire and other states, including former Portland, ME Poets Laureate Martin Steingesser, Steve Luttrell, Bruce Spang and Marcia Brown, and also former Maine State Poets Laureate Betsy Sholl and Baron Wormser. The cover art is by Maine artists J.D. Asmussen and Andy Curran. All proceeds from this book benefit the nonprofit Maine State Society for the Protection of Animals in Windham, Maine, New England's largest horse shelter. Check out their organization at www.msspa.org and consider visiting their beautiful farm on River Road in Windham. They are open every day 1-4 and love to do tours for classes and other groups. Please consider buying this anthology and also our first one entitled AGREEABLE FRIENDS, both of which benefit the MSSPA. These books are wonderful holiday gifts for your animal-loving friends and family. my dog dead on the shoulder.